“…As of January 23, 2006 the Chelmsford High School Amateur Radio Club has officially received the club call sign: KB1NAY. We will use it tomorrow January 27, 2006 from around 9 AM or so. Due to finals at CHS we only have a few hours of school for testing though I am not sure on the exact time we will be on. I will try and let you know when I find out but we should be there past lunch at least. So QRZ.com or ARRL the call sign if you want! We will mainly be on 20 meters voice and maybe a few other of the daytime bands, so keep an ear out for us using our brand spankin’ new call sign. You also have the chance to talk to some of the up and coming young amateur radio operators! N1DT and K1VV plan to activate Conimicut and Nayatt Point Lighthouses (ARLHS USA 188, 532) under the call W1AA on Saturday, January 28, 2006 from 11:30 UTC (7:30 AM EST) until 19:00 UTC (2:00 PM EST). “For the first time, early on, we will to try to work the close in W and VE 1, 2 and 3 operators using 75 SSB,” writes Robert “Whitey” Doherty, K1VV. He notes that the phone frequencies are: 475 SSB 3990 – 3998 , 40 meters- 7209, 7223, 7248, 7281, 7287 plus or minus interference. Operation on 20 meters will be above 14300; 17 meters, above 18150. CW contacts will occur on the half hour on 7.035, 14.035, and 18075. Doherty notes that they’ll have a packet station in the truck and can spot themselves on the worldwide DX packet cluster. Located on Nayatt Point in Barrington, Nayatt Point Lighthouse marks the eastern side of the entrance to the Providence River from Narrangansett Bay. Conimicut Lighthouse was initially a wooden daymark built in 1858 to mark dangerous Conimicut Point Shoal in the middle of the entrance to the Providence River. An Eastern MA amateur will have his technical project featured in an upcoming issue of QST Magazine. 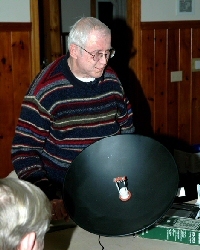 Jim Hanson, W1TRC of Maynard is shown demonstrating his ultrasonic powerline arc detector at a recent Nashoba Valley Amateur Radio Club meeting. Hanson designed the device to identify power line noise sources caused by arcing. W1TRC says he has used the device to help find fourteen powerline problems near his home. I would like to take this opportunity to briefly outline our efforts with the Governor’s Office since the “Town Meeting” incident last November. 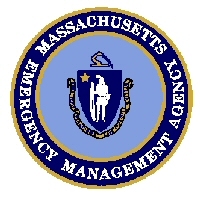 Section Emergency Coordinator Rob Macedo, KD1CY, Assistant Section Manager Mark Duff, KB1EKN, and I attended a meeting in December with Massachusetts Emergency Management Agency Director McCombs and Response and Recovery Branch Head John Tommaney. Both expressed their full support and appreciation for our efforts in supporting MEMA. As I reported in an earlier message, representatives from both the American Red Cross and the Salvation Army have also personally expressed their support to me on your behalf. Additionally, Rob and I met with the Governor’s Staff and Director McCombs last week at his office at the State House. It was a very satisfactory meeting with both teams agreeing to a set of outreach activities and timeline. I now consider the matter closed, and I hope you will too. MEMA continues to be impressed with the ability of RACES and ARES to participate in the SKYWARN program and provide initial damage reports to the NWS and MEMA which are factored into operational disaster plans as required. They stated that during the initial phase of the disaster, damage assessment reports may be delayed until the proper personnel can get in place. Hams would have the ability to communicate immediately until the state’s resources can be brought to bear on the situation. The points that Director McCombs and John Tommaney made to us at our December meeting were reiterated to the Governor’s staff and it was an opportunity for Rob and me to explain Amateur Radio’s capabilities to the Governor’s staff. 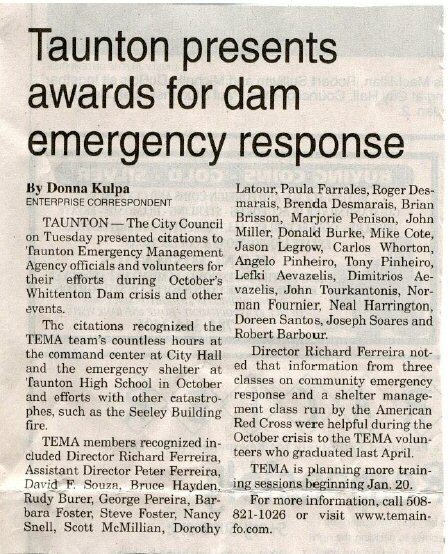 It appeared that the Governor’s staff and MEMA officials were very attentive, and offered additional suggestions for an outreach. In particular, MEMA reiterated their appreciation of the fact that hams are naturally dispersed across the region, and believe the hams have a critical role during the initial stages, not just when communication systems go down. The Algonquin Amateur Radio Club will hold its annual flea market in Marlborough on February 18, 2006 at the Marlborough Middle School from 9:00 am until 1:00 pm. General admission is $5.00; VEC exams begin at 9:00 am. For more information, please contact Ann Weldon, KA1PON, at 508-481-4988. Rick Ferreira, KB1KWF Director of the City of Taunton Emergency Management Agency (TEMA) and Peter Ferreira KB1LXG, the assistant Director, organized a volunteer recognition night at the Taunton Emergency Operations Center on December 20, 2005 that turned into a great holiday social event for all the TEMA volunteers. 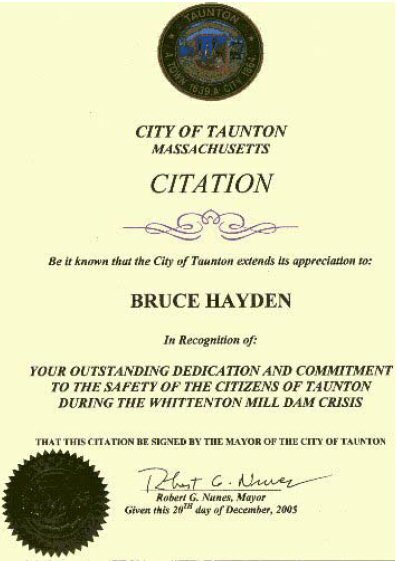 The group met with Mayor Nunes in the City Council Chambers and were presented with a citation like the one shown here. A potluck supper followed; fun was had by all. Seven Whitman Amateur Radio Club members were involved. I’m pleased to report that I had a great meeting with the Boston Emergency Management Agency this week. They are very pleased with [the Boston Amateur Radio Club] and have asked us to prepare a list of equipment that we need to operate at the EOC. The EOC wants to rearrange its layout and put all radio operators in one location to lower the noise floor. Along those same lines, I met with other City of Boston representatives to discuss the ongoing plans for the Strategic National Stockpile. 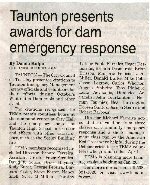 Again, they are very happy to have BARC involved with these efforts and have asked us to participate in an exercise in June, 2006. Details are sketchy at this point, but it appears they will deploy a couple of dispensing sites, have a couple of “virtual” sites and staff a command post and warehouse. We will be asked to provide Amateur Radio support for this exercise and as soon as I receive additional information, I will forward it to you. A Technician class will be conducted at the City of Taunton’s Department of Public Works from 7:00 until 9:30 p.m. beginning February 23. The classes will last for 9 weeks. The course will use the “Now You’re Talking” book. Participants are requested to sign up by Feb. 13. Email Peter Ferreira, KB1LXG at tema2@tmlp.com. The Marathon Amateur Radio Communications team is seeking volunteers for the 2006 Marathon, from Hopkinton to Boston, on Monday April 17, 2006. Amateurs are needed to staff three primary teams, targeted for the Start Area, Course/Route, and Finish Area. These teams will provide coordination for public safety and medical related functions at the event. and follow the instructions posted there. I activated W1AF in a full-time effort in today’s (/14/06) North American QSO Party-CW. This is a 10-hour contest requiring an exchange of name and state/province or country. Multipliers count once per band, so there is a premium on selecting bands carefully and hunting for multipliers. Unfortunately, 15 and 10 meters were not doing well today, so I was stuck on 20-80. 160 was doable on the 80 m dipole with low power, but only for contacting the big guns. Here are the stats. This score would have placed W1AF 3rd out of about 20 entries in the 1 call area in last years, and would have placed first in MA by 10k points (still way behind the national winners, though). Hope someone will have a chance to activate the station for the phone event–it is next weekend. Also, the ARRL DX Contest (Phone) coming up in Feb would be a good chance to demonstrate DXing to any prospective hams out there. Approximately 35 ARRL-affiliated club representatives, Section Managers, and members of the New England Division cabinet met for a day-long session on Saturday, January 7 in Springfield, MA. Notes from the meeting can be viewed on-line. The meetings are intended to brief club leaders and division appointees on recent League activities, and to elicit input for the Director on matters that may come before the Board. The meetings are conducted in July and January, 1-2 weeks prior to the ARRL Board of Directors meetings. The Framingham Amateur Radio Association will hold its annual spring flea market and volunteer exam session on Sunday, March 26, 2006 at the Walsh Middle School in Framingham. Doors open at 9 a.m. Admission for buyers is $5 (under-12 free with adult). Seller setup starts at 7:30 a.m. Tables cost $15 in advance, or $20 at the door. For further information, visit the FARA web site at http://www.fara.org/flea/. Bob Phinney, K5TEC, of the Clay Center Observatory (in Brookline) is hosting this meeting and will be providing an overview of the research going on at their facility. Past programs included telescopic tracking of SpaceShipOne launch October, 2004, and laser imaging of the International Space Station. The Clay Center for Science and Technology is owned and operated by Dexter School and Southfield School. It houses high-tech science labs, an astronomical observatory, and amateur radio repeaters. It is powered in large measure by alternative power sources on the roof. It also served as the net control center for the 2005 Boston Marathon. The Clay Center is located at 20 Newton Street, Brookline, MA 02445. For additional information about the Center and directions, visit http://www.claycenter.org and http://www.dexter.org/map.html. This is also your chance to view MMRA’s newest repeater site, as the Brookline 146.820 machine is located here. This site provides wonderful coverage and talk-in will be provided on this system (PL 146.2). The MMRA maintains 15 repeaters in Massachusetts open to all hams. These can be linked for special events, nets, and emergencies providing coverage throughout eastern Massachusetts. Please visit http://www.mmra.org for information on this outstanding club and consider joining and contributing to their work. If you plan on attending, please let Steve Telsey, N1BDA, know at steve.n1bda@verizon.net so that proper space can be reserved. 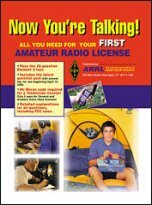 The Framingham Amateur Radio Association will hold a Technician “License in a Weekend” course on March 17, 18 and 19 at the Danforth Museum in Framingham. The cost is $40 and covers all materials, lunches, and exam fee. For more information, email Ed Weiss, W1NXC, at w1nxc@arrl.net or phone 508-881-2301. ICS-200 Class Needs More Participants! [The Massachusetts Emergency Management Agency] has only four people signed up to take this ICS-200 class in Leominster this weekend. This is a weekend course, that 30 people told me they were interested in taking if it were offered on a weekend. This class is at risk of being cancelled if additional people do not sign up by noon on Wednesday. Please call MEMA right away if you need this class and plan to take it beginning this weekend. PURPOSE:  This is a two-day course. Incident Command System is a nationally accepted standard that integrates all of the response entities under the Incident Command System. The course will familiarize participants with the principles of this Incident Management System. Participants will demonstrate knowledge of the principles through group problems based on response to various scenarios. The ICS principles learned are applicable to any response situation. or Local Officials who play a role in responding to a major transportation incident/accident. LUNCH:  All students on their own. Please fill out form clearly and completely. NOTE:  All courses are subject to cancellation based upon registration received by Friday, January 6, 2006. All applicants are enrolled on a first-come, first-serve basis. *All students will receive a confirmation call prior to class indicating their acceptance. Anyone trying to recruit a new Tech. should note that the VECs are replacing the Technician/Element 2 question pool a year early. So, you have less than six months until your current copies of Now You’re Talking become obsolete on July 1, 2006. The schedules are likewise moved up a year for General/Element 3 (July 1, 2007) and Amateur Extra/Element 4 (July 1, 2008).